Ken Potter has a strong passion that goes far beyond simply wanting to help dealers brand themselves, which may come as a surprise since Ken works for the Company, Build-A-Brand, but at the same time, it is also one of the major reasons why he chose to be its President. This paradox comes from Ken recognizing that any person or vendor with branding expertise has the ability to show dealers how to self-brand. His concern lies heavily, not with having access to branding information, but, with the quality of it. Ken believes that what is currently being provided to salespeople needs to meet higher standards, for how dealers brand themselves, is what ultimately affects the customer perspective and buying decision. It is no secret that the auto industry has had a bad rep, but Ken wants to eradicate that thought by connecting with one dealership and salesperson at a time. Early in his career, Ken consciously decided to constantly strive to find new and innovative ways to assist those in the automotive industry by improving the quality of their dealership, salespeople, and customer experiences. Brian Chapman, the CEO of Build-A-Brand, shares some of the same viewpoints as Ken and is why he invited him to become a part of the team, earlier this year. Ken, wholeheartedly believes in the Build-A-Brand message and branding products and feels this is the best way to take branding to another level, one of which, is positive, of high-quality, innovative, and non-disruptive to the current dealer process. He knows this can be done with connecting dealers to Build-A-Brand. Ken not only wants to provide dealerships and their salespeople with revolutionary technology, but he also wants his industry-leading executive team, as well as himself, to join in on every dealer’s branding journey. What drives him is his persistent notion of wanting to improve each dealer for the better, as well as, the auto industry as a whole. Ken does not only have a love of cars, but he also has great respect for those who sell them. It is his mission to assist dealers in producing high-quality, successful, and memorable brands in the efforts of delivering customers with, nothing less than, an exceptional car buying experience. The only ways in which all of this can come to fruition is by having Ken introduce you to what is offered by Build-A-Brand and by allowing him to join in on your branding journey. 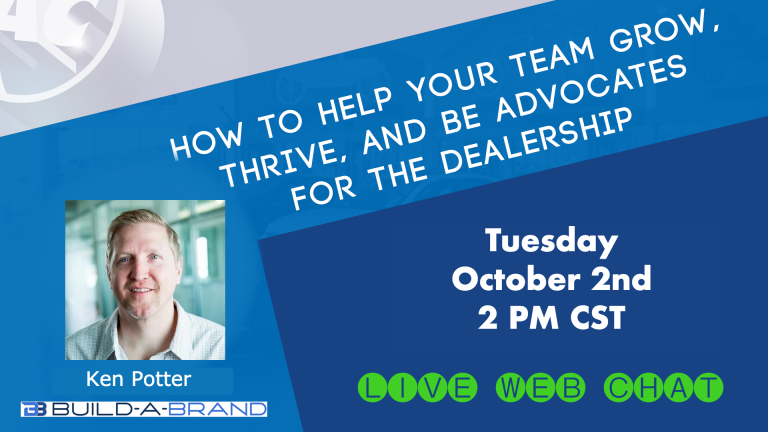 If you want to hear more from Ken about branding, join him on the AutoConverse New LIVE Web Chat – Mastermind Series, as he covers the topic, “How To Help Your Team Grow, Thrive, And Be Advocates For The Dealership” with host, Ryan Gerardi. WHEN & WHERE? This event happens on the AutoConversion YouTube Channel, Tuesday, October 2nd, 2018 at 2 PM CST/ 3 PM EST. If you are unable to attend the LIVE Web Chat, feel free to catch the recording! We also invite you to RSVP to let us know you are planning on watching this event along with us. Ken and the rest of the Build-A-Brand team hopes to see you there!